I’ve been lazy. Haven’t updated you like I should. I’m sorry. Really, I am. But, time is short. Weeks are flying by. I’m enjoying my summer. I’ve been distracted. Besides, I just got back from the beach and then my parents stopped by to help do some projects around the house for a few days. What’s a girl to do? There just isn’t time for everyone. I had to put you on the back burner. Don’t be mad at me, Blog. I’ve gotten word that my readers are frustrated too, so I know it’s not you….it’s me. I promise to try harder. Oh, and I know you are tired of your look and you need an update. I’m sure you are offended that I still haven’t changed that header photo to include Meyer. I just don’t have any pics of our whole family yet. I’m working on that, I promise I am. Don’t give up on me! 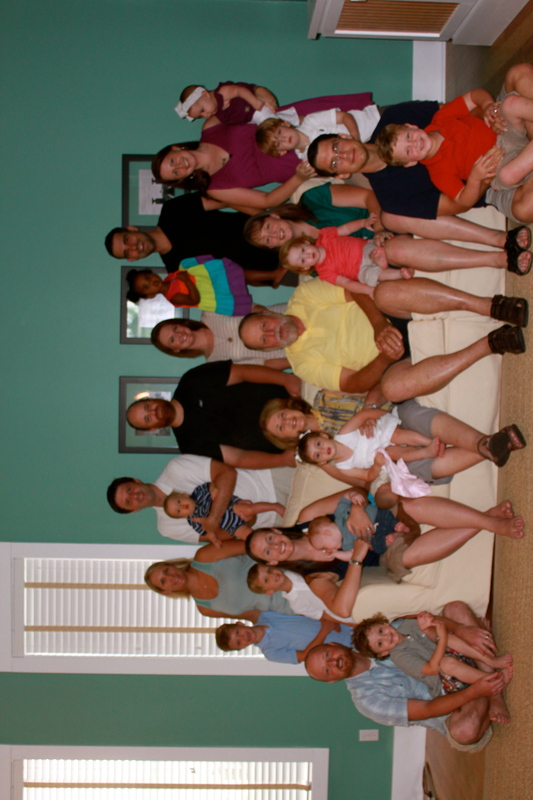 But just to keep you happy…here’s a picture of my entire family at the beach to suffice you until I can grab a few minutes to write a real post about our time with the Hill Family. If you would like a fairly decent amateur to take a family photo, let me know! I’d love to do it!! yes please!! I’ll message you! !